Last year I had an amazing trip to go see the larches turning colors, but I didn’t take my children along. They were disappointed and have been seeing photos of lovely landscapes glowing with golden larch trees. They really wanted to go somewhere this year. 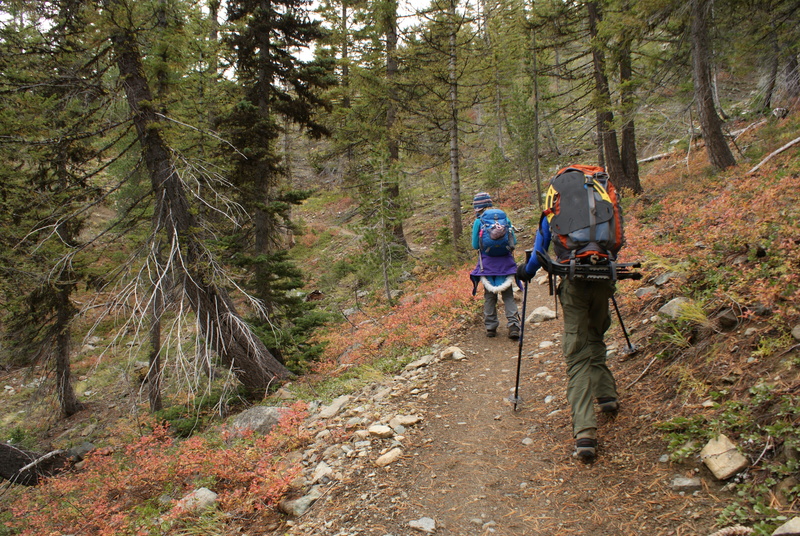 Some folks had been saying the trees were prime up near Ingalls Lake – I knew we couldn’t get that far in one day, but I thought we could do the other trail that branched off from there, Longs Pass. 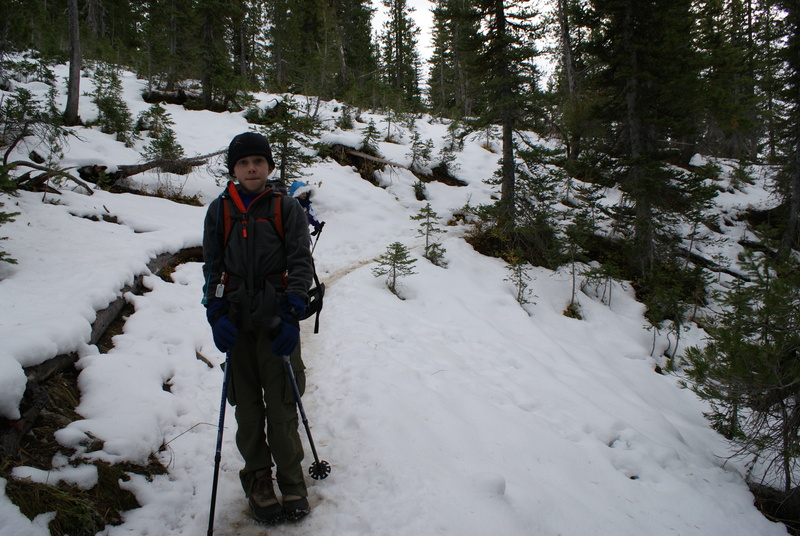 We got within 0.6 mile of the pass, but snow and fatigue stopped us from making it all the way. 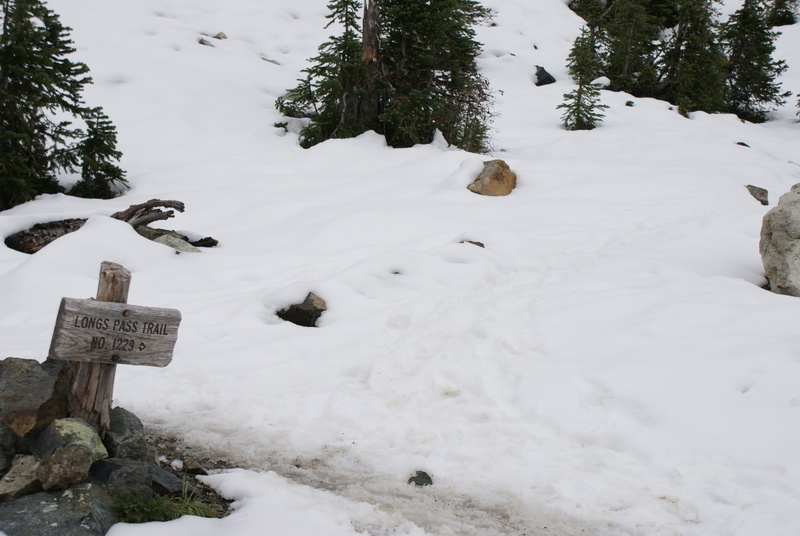 I tried to do my research about this trail, and it looked doable, even with the snow that we knew had blanketed the area a couple of weeks ago. We had a few delays getting out of town, but the drive wasn’t too bad, and we got a decent start from the trailhead. We always get a lot of curious looks from other hikers, with my giant pack, and going out on a school day. 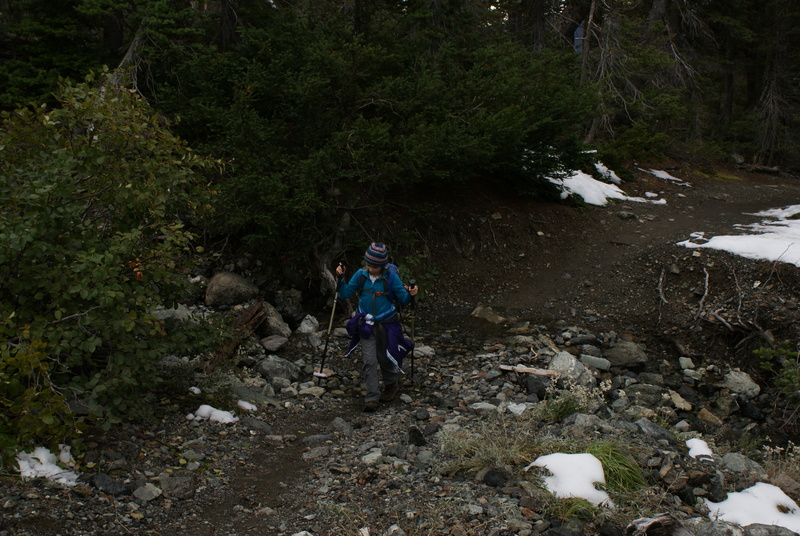 This time was even more entertaining, since I had both my snowshoes and Annika’s strapped to my pack, plus I had some winter layers along, making me look and feel like a Sherpa. 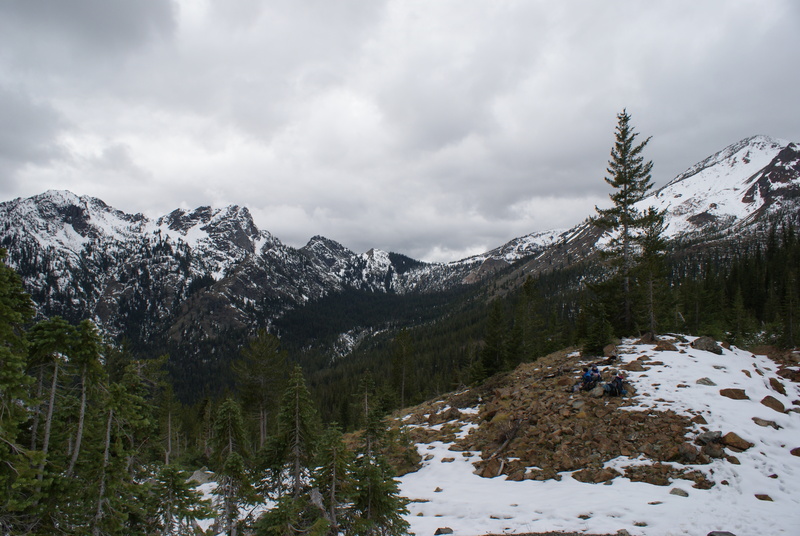 The sky was grey at the Esmerelda trailhead; we had left the sun behind in Cle Elum. 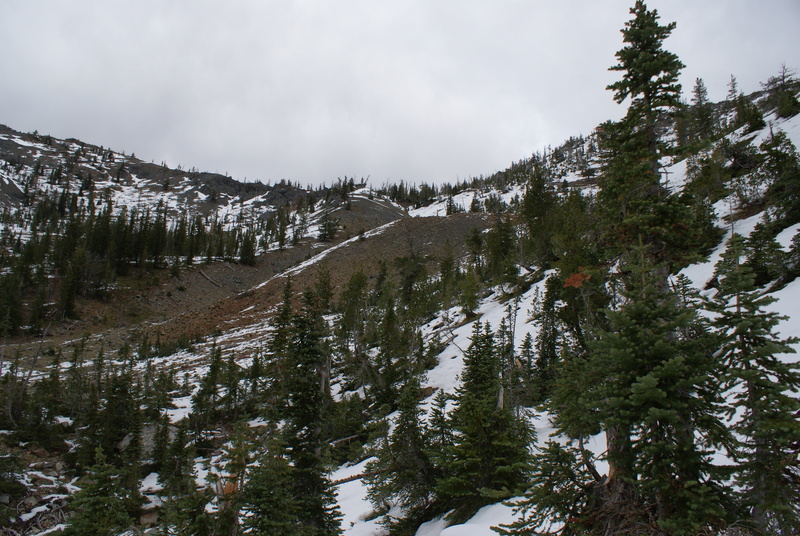 Esmerelda Peak had a dusting of snow in the crevices, and temps were around 40 degrees. We trudged up the first 0.4 mile of the trail – Joan Burton’s book says if you can coax kids up this steep beginning section, they’ll make it up the Esmerelda Basin trail just fine. We stopped at the junction, though, where we had a brief snack and shed layers before turning up the Longs Pass/Ingalls Lake Trail. The kids did really well on the climb. 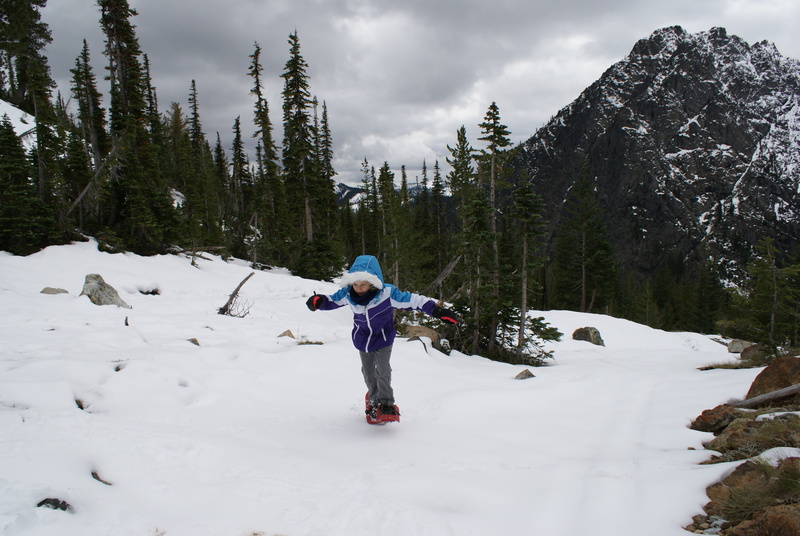 This is not a normal trail in the kid hiking reports – it goes up and up and up. The huckleberries were turning yellow and bright red along the hillside, contrasting prettily with the yellowing ferns and other shrubs. But they all seemed to be waning in color, preparing for the wintery weather that will soon arrive. We stopped about every 30 – 45 minutes for a snack and water break. At one point I pulled out the thermos of hot cocoa to help revive the flagging troops. I entertained the kids while we were walking with a few poems I still remembered from my childhood – The Road Less Traveled and the Jabberwocky. Gabe made up nonsense phrases using whatever large words that came to mind. We chatted with folks coming down, trying to get beta on the trail we wanted to take. 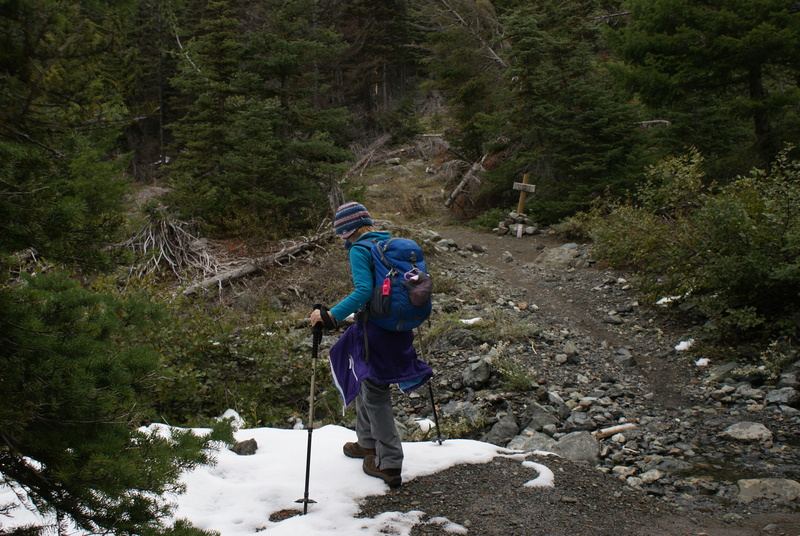 One group of ladies said that the Ingalls Lake trail was easy to follow, but the Longs Pass one had not been traveled since the snow. That made me uneasy, but I thought at least we’ll get to the junction and see with our own eyes what we’d be facing. Up and up and up we went. 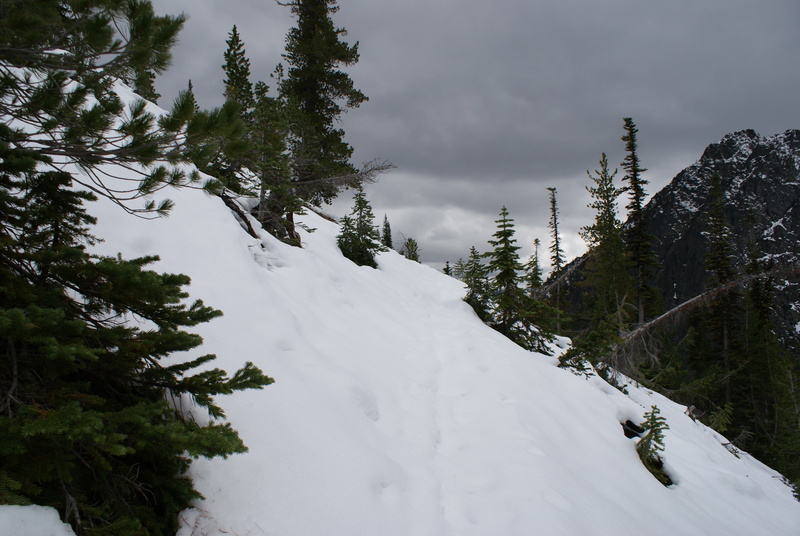 The snow patches became more solid cover, and portions of the trail had slush and compact snow on the tread. Temps dropped a bit. I was really starting to have my doubts, especially since Annika was losing all of her enthusiasm. We had reached our mid-afternoon slump time, notorious with my kids for being unpleasant and difficult for hiking. Finally we reached the trail junction. 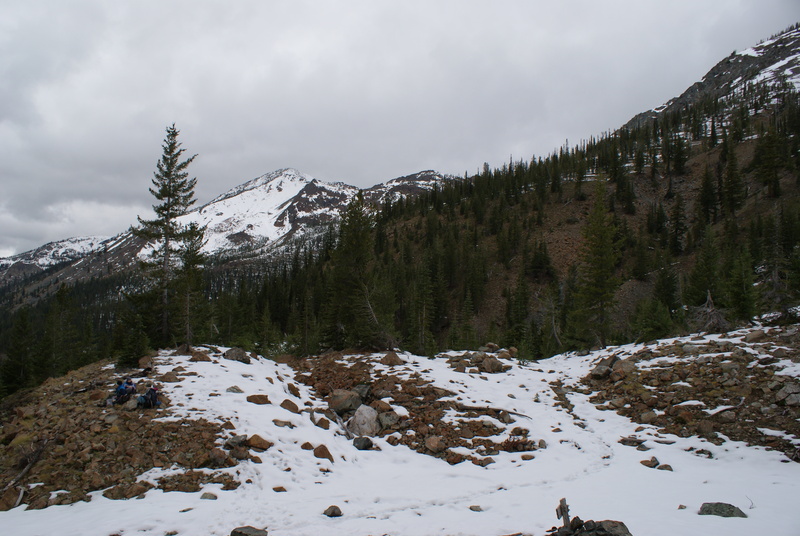 The Longs Pass Trail was indeed covered with snow, while the Ingalls Lake trail continued to be mostly dirt. We found a pile of wind-scoured rocks to dump our gear on, and decided to rest and fuel up before deciding for sure what to do. 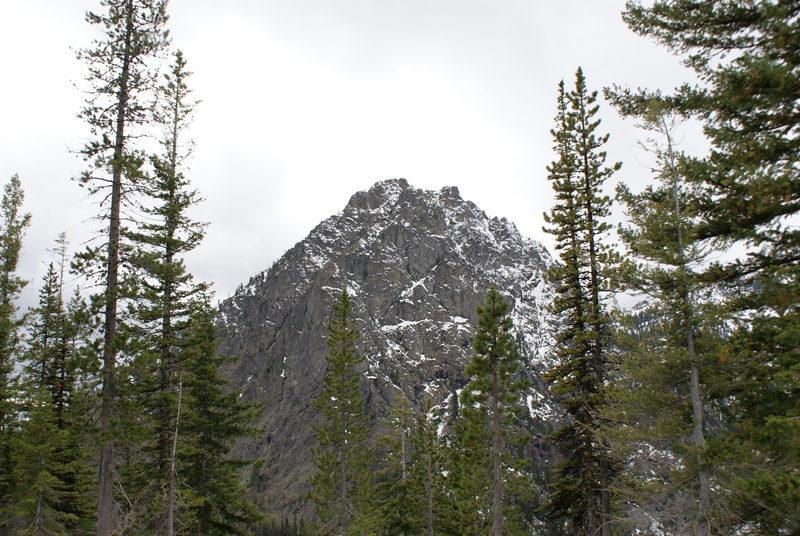 I walked a little ways up the Longs Pass Trail – someone had booted it straight up the hillside, but the trail itself, while easy enough to see at that point, curved around the outside of a steep hill. 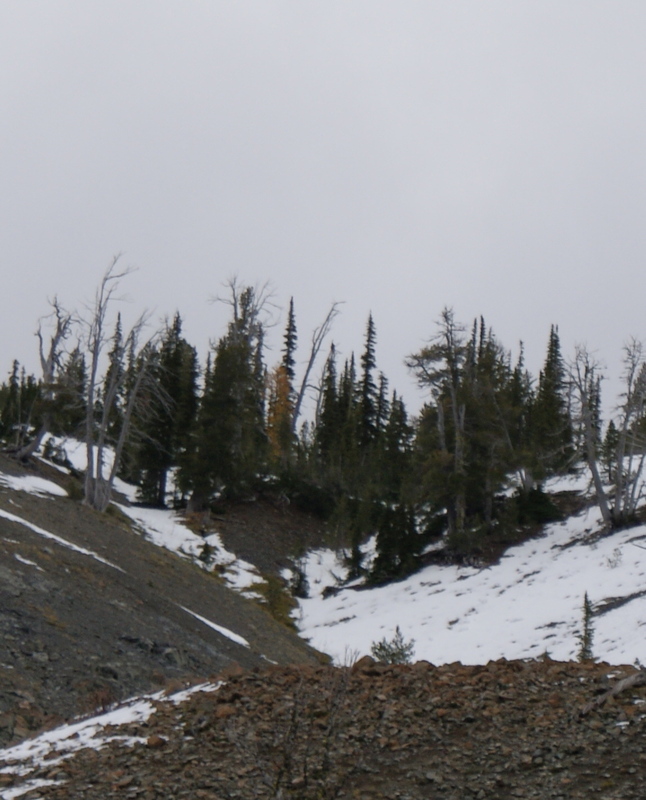 The trees were much smaller here, as we were almost to timberline. 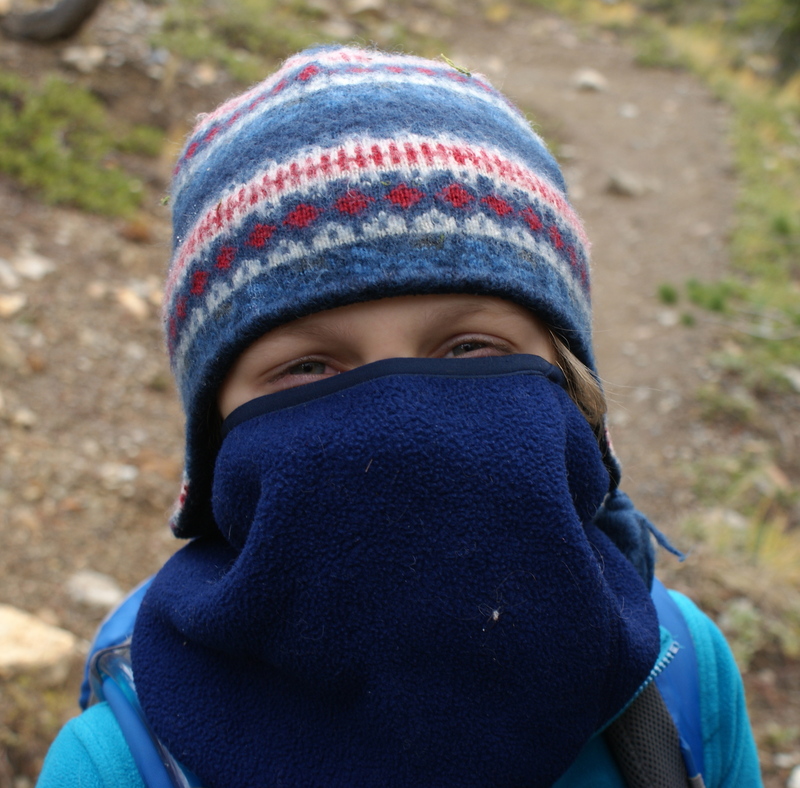 I really didn’t feel good about taking my kids up an untraveled snowy trail on the side of a hill when they were tired. We made the decision to stop there and call it a day. 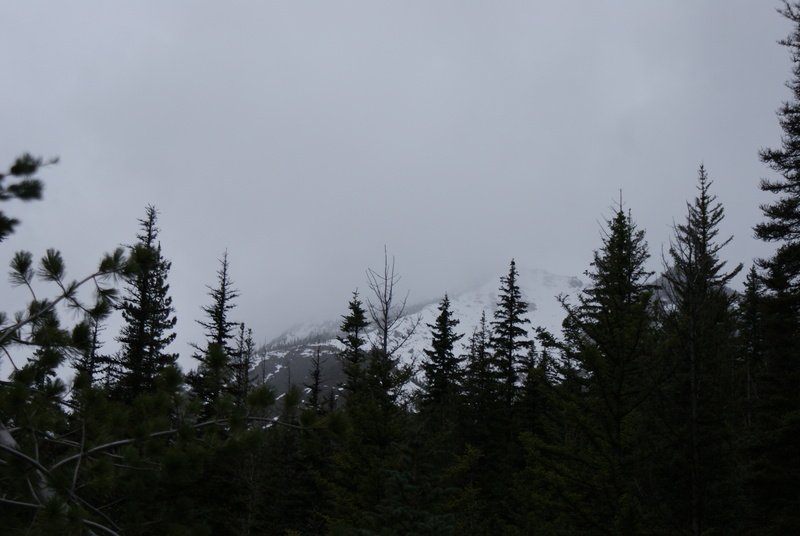 We thought we could see one lone larch up by the pass. The kids were disappointed, but not enough to really complain. We briefly entertained the idea of trying for Ingalls Pass, but adding another 3 miles RT to my already tired children seemed like a bit much. If I had been by myself I definitely would have done that. It was after 3:00, though, and the clouds seemed to be getting darker to the west. It felt like the weather was changing. 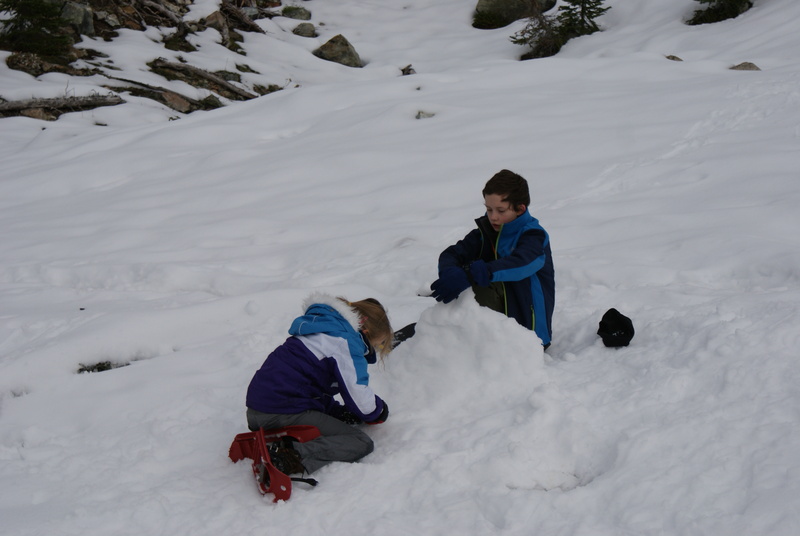 The kids asked to try out the snowshoes and play awhile, so I strapped them up and let them have some fun in the snow. They threw snowballs at each other, and then built a wall to try to divide their territory. I ate my snacks, put on more layers of warm clothes, and tried to stay out of the wind. We occasionally heard a pika meeping in the rocks somewhere above us. When it was getting close to 4:00, I gathered the troops back together and we began our trip back down the switchbacks. We made it back to the trailhead in half the time it took to get up. The kids made up stories to tell each other on the way down for entertainment. I was happy to see we were not the last ones down off the mountain. I pulled some leftover soup out of the car to heat up for dinner, and we ate a hot meal while some rain showers started to fall. It’s super nice to have picnic tables at the trailhead for such an event. It was cold and getting dark quickly. We hurriedly packed up and hit the road back home. A few random notes: The outhouse at Beverly Campground was open and had TP. 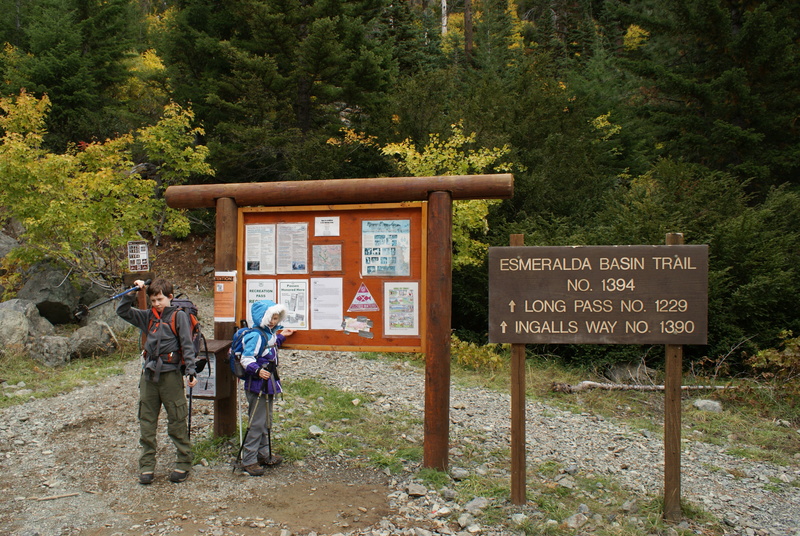 The Esmerelda/Ingalls Trailhead outhouse was open but had no TP. Lots of groups were set up along the Teanaway River Road for hunting season. The road was more potholed and washboarded than I remembered from 2 years ago. But it was still passable in a Camry. The fall colors along the way to the trailhead were lovely, and we saw two eagles and some hawks. Several people complimented the kids on how far they had gotten on this difficult trail; thanks so much to the folks who took the time to encourage my kids. Total distance: 4.8 miles, about 1500 feet elevation gain. If I had to do it again, I’d choose the longer drive up Hwy 20 and go to Blue Lake, but I’ll bet in a year or two the kids will be able to do this hike to the end.